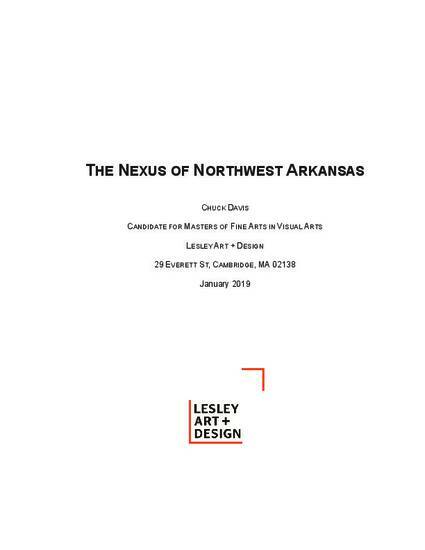 With a narrative, neo-journalistic voice, I seek to convey new complexities to the state of Arkansas and specifically its northwest region. Postcards and placards react and reverse the popular shibboleth of a slow, rural sociotype – the Southern man, woman and family – which is at odds with contemporaneous definitions of the people to this state. I call this work and its observations the Nexus of Northwest Arkansas. This thesis describes the formation of my message, its critical theories and major influences. Above all, the work, and the writing about this work, seeks to reframe popular beliefs, stereotypes, media-driven characterizations.